Leading OEM Manufacturer of er nylon filter cartridges, polypropylene filter cartridges, pharmaceutical filter cartridge grade, industrial grade ptfe filter cartridge, filter cartridge and nano shield filter cartridges from Surat. Nano Shield S Series Polypropylene Filter Cartridges have been engineered to combine the highest level of particle retention with superior flow rates and minimal pressure drop for most chemical applications. Utilizing Hollow Fiber Technology (HFT), NanoSHIELD is able to provide up to 2 times more filtration surface area as compared to an equivalent size pleated filter. This translates into significantly higher flow rates and lower pressure drop. In addition, CUNO’s HFT produces a membrane that is up to 2 times thicker than other technologies which in turn maximizes the depth of filtration and particle removal efficiency. Peak Performance Provided by Hollow Fiber Technology (HFT). 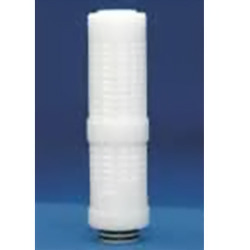 A single NanoSHIELD 10” filter cartridge can replace one standard 20” plated filter cartridge rated similarly. Increasing flow rates while maintaining filter efficiency provides for faster bath clean-up, reduced pump wear and lower energy consumption. Up to 2 times more surface area than similar size pleated filter cartridges allows NanoSHIELDS a lower pressure drop and increased contact or residence time with high viscosity fluids like polyamide. Maximizing filtration surface area and contact time improves filtration efficiency and reduces recirculation time. Bacterial removal to levels in excess of 105 cells/cm2 was verified using ASTM challenge procedures with Pseudomonas diminuta as the test organism. The Diffusion Flow Integrity Test was correlated to 100% bacterial retention. The Zetapor 020 ST filter provides consistent water flow rates. The average data from the water flow analysis is represented by the solid line on Graph 1. Defined flow rates provide process consistency and a means for system sizing. Sterilization The Zetapor 020 ST can be sterilized by in situsteam or autoclaved for up to 5 hours at 145°C. 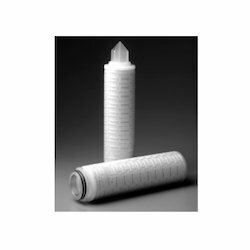 The Zetapor ST 0.20 µm is a titer reducing membrane filter cartridge. It has been designed to provide the user with a high capacity, biologically safe, and reliable filter device for applications where a low bioburdon (final filter) or high bioburdon (prefilter) is present. The Zetapor 020 ST has passed the USP XXI Class VI Safety Test and has been validated for bacteria removal in excess 105 P diminute/cm2. 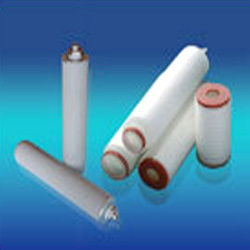 The non-pyrogenic filter cartridge is also capable of removing contaminants smaller than the rated pore size because of electrokinetic adsorption, which provides a highly efficient vehicle for particle retention and pyrogen reduction. The Microfluor FA has been designed to allow high flow with low differential pressure. Graph 1 presents the average water flow rate for the tested cartridges. The flow rate is for a single 10" element at 25 C with housing losses deducted. 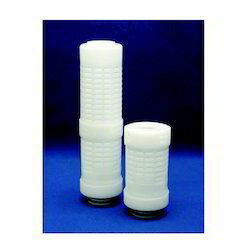 Microfluor MR.FA3.0490 BENEFITS Durable Polypropylene Construction Broad Chemical Compatibility Various Cartridge Styles for Easy Installation higher flow rates at a lower pressure drop and is not integrity testable. The Microfluor FA is a 0.20 micron hydrophobic cartridge constructed with a single layer of polypropylene reinforced GoreTex patented PTFE membrane. Poly-propylene cartridge components, including Delnet up and downstream support, ensure both the membrane rigidity and compatibility required for severe operating conditions. For further information, contact CUNO or your local distributor. The Microfluor FA is a 0.20 micron hydrophobic cartridge constructed with a single layer of polypropylene reinforced GoreTex patented PTFE membrane. Poly-propylene cartridge components, including Delnet up and downstream support, ensure both the membrane rigidity and compatibility required for severe operating conditions. For further information, contact CUNO or your local distributor. Microfluor cartridges are designed for removal of contaminants from aggressive solvents, corrosive liquids and gases. The 020 FA cartridge is also suitable for non-sterile vent applications. Chemicals - Fine Chemicals, Reagents, Solvents. Industrial - Solvents, Vent Filtration, Solvent Recovery Systems and Process Gases. Photographic - Photo Emulsions and Chemicals. Semiconductor - Process Solvents, Acids, Etchants, Photoresists, Strippers and Tank Venting. 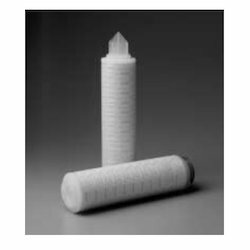 Dimensions (Nominal): 2.8" OD, length to 40"
We have gained expertise in providing our clients with a comprehensive range of Filter Cartridge that is specially used for filtration at corrosion resistance and high temperature applications. Our range includes stainless steel cartridges, and is known for their durability, excellent performance and reliability. Apart from this, these can also be customized as per the specifications detailed by our clients to fulfill their exact requirements. Nano Shield Filter cartridges have been engineered to combine the highest level of particle retention with superior flow rates and minimal pressure drop for demanding applications at the 65nm node. Peak Performance Provided by Hollow Fiber Technology (HFT) NanoSHIELD filter cartridges with HFT provide up to 2 times more surface area and up to 5 times higher flow rates at the same pressure drop when compared to pleated membrane cartridges. This increase to flow and decrease to pressure drop allows a typical 10” NanoSHIELD filter cartridge to perform similarly to a 20” pleated filter cartridge. This significant advantage allows for the use of smaller and less costly filter housings which reduce hold-up volume, filter change-out times, and total cost-of-ownership for the life of the process. In addition, CUNO's HFT produces a membrane that is up to 2 times thicker than other technologies which in turn maximizes the depth of filtration and particle removal efficiency.